I Learn French: French Food Fight Friday: "Quality partridge should have the fresh smell of an infant’s diaper." French Food Fight Friday: "Quality partridge should have the fresh smell of an infant’s diaper." 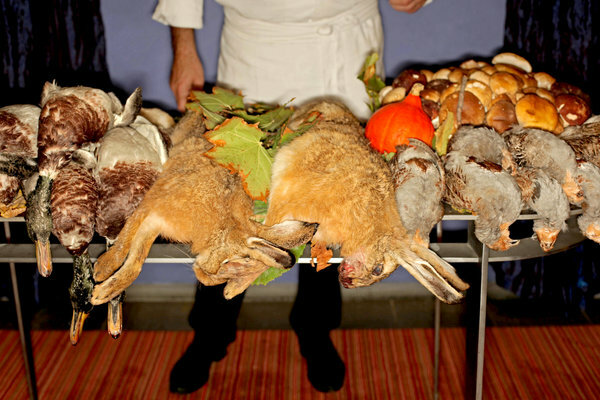 This week on French Food Fight Friday, I'm actually ready to start a fight: against the US government, which, for the most part, does not allow the serving of wild game in restaurants. France, by contrast (vive la différence!) celebrates the preparation and consumption of wild game this time of year. Restaurants have relationships with hunters, who bring their freshly-caught game to the back door, slung over their shoulder, still warm and furry. But in our antiseptic, overly-regulated culture, everything we consume has to be slaughtered and wrapped in plastic before we are allowed to eat it. "Female birds are to be venerated, not killed"
Read the full story on hunters and French diners, and sigh with regret. Now a TV5Monde blogging partner! Wordsmith Wednesday: What do the French call a French kiss? Mon Dieu! "The New Yorker" misses French idiom! Google Translate blows "Happy New Year"
The author of two critically-acclaimed memoirs, I'm now learning French (or trying! ), discovering the joys and frustrations of tackling a language in (late) middle-age. Follow along -- and contribute! Never be embarrassed again! 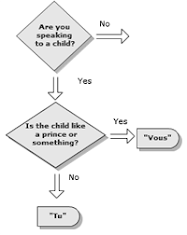 Download this handy guide to using vous and tu! The most informed, comprehensive, and objective language product reviews on the web! PoliLingua provides high quality French document and media content translation, transcription, website localization for corporate and private customers at reasonable prices.